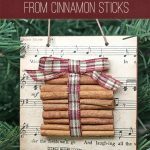 While I am taking a much‐needed Thankgiving break, my friend and blogger Niki Meiners of 365 Days of crafts has a quick and easy handmade food gift for you. Thanks so much Niki for holding down the fort here at CSD! Looking to spice up your holiday gift giving or do you want to give handmade gifts? This Cajun Spice infused olive oil takes care of both. Not only is it a great gift for the Foodie on your list it is a fun gift for those who like to cook at home and like it spicy. There are two ingredients and a few embellishments on the bottle. Super easy and quick. It is best to make the infused oil one to two weeks ahead to allow the flavors to reach their peak. 1. Clean and sterilize bottles. 2. Slip spices into bottle. Use a funnel to pour in olive oil. Add the cork. 3. After filling and corking bottles, wash and dry them well. 4. Apply label to front of bottle. 5. Wrap twine around the neck of the bottle and adhere with hot glue. 6. Tie tag on to bottle. Add a tiny drop of hot glue and add the button. 7. Set in a cool place until time to give. To prolong the life of the oil, refrigerate bottles. If you are using dried spices, the shelf life is 3 months. I also add a label on the back of each bottle so the recipient knows what they are getting and how long it is good. So happy to share my recipe with you!